The Epic Motorsports Engine Calibration Interface (ECI) was developed as a means to give BMW enthusiasts more control over their BMW’s engine performance. With this specially designed ECI tool, you have the ability to install the full range of Epic performance software calibrations and/or return the vehicle to its factory calibration settings. The ECI also doubles as an OBD II scanner capable of reading and clearing DTCs (Diagnostic Trouble Codes). 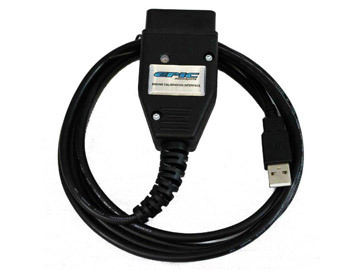 Your unique ECI tool plugs into your vehicle’s OBD II port and into the USB port of your PC. With the user-friendly Epic Engine Calibration Interface PC software, you can read the existing factory (or aftermarket) programming from your vehicle’s ECU. After purchase of an Epic tune you email your current calibration data to Epic for an upgrade to one of the various Epic Motorsports calibrations optimized for the specific vehicle. You will then load your modified calibration file into the ECU using the same ECI tool. You now have complete control of the calibration that is in your car, switchable from modified or stock at will. For those concerned with warranty, the factory calibration can be reinstalled before a trip to the dealer, leaving absolutely no trace of “tuning”. 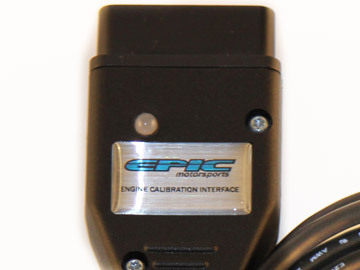 After service/warranty work, you can reinstall your Epic Motorsports calibration. The Epic ECI is only available when purchasing an Epic calibration or for previous Epic calibration purchasers. ECI loads coded Epic files only. This tool provides an easy method to load and switch calibrations; it does not give you the ability to view and modify your own files. Epic ECI marries to the ECU of your car on installation, after which it cannot be used on another car. For use with PC-based computers only at this time.